Preheat oven to 220 C and place a rimmed baking sheet in oven as it heats. Toss broccoli, onion, and garlic with oil and salt. Spread out on hot baking sheet and roast until broccoli is darkened in spots, about 20 minutes, stirring once. Place broth, roasted vegetables, broccoli microgreens, feta, beans, lemon juice, and chili powder (if using) in blender or food processor container and blend until smooth. Warm soup in saucepan, and thin as needed with additional broth or water. 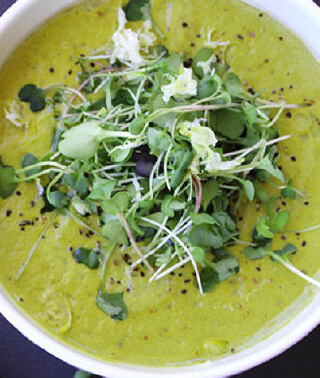 Serve soup garnished with additional microgreens and feta, sunflower seeds, and a drizzle of oil.